From Hello Kitty, to cat island, to cat cafes, you’d be forgiven for thinking that Japan is a nation of cat fanatics; but who among us isn’t? Cats in Japanese art are nothing new. In fact the world’s first novel, The Tale of Genji, even featured a cat as one of the main plot catalysts in the story, way back in the 11th century. From ukiyo-e prints to contemporary watercolors, in the history of Japanese art there’s arguably been no bigger muse than the cat. We’ve taken a deep dive into world of Japanese cat painting to explore this fascinating phenomenon, and bring you 10 of the most charming works of feline art. Two young women just out of the hot spring baths are set upon by an adorable kitten in this woodblock print by one of the country’s most highly respected ukiyo-e talents, Kitagawa Utamaro. The artist was already indulging in one of his favorite artistic motifs of beautiful women and mischievous kitties over 200 years ago. Light and playful it’s the perfect encapsulation of Utamaro’s love of the female and feline forms. Taken from his series Thirty-two Customs and Manners of Women this famous cat painting by Tsukioka Yoshitoshi is entitled Tiresome and captures the tender love of a woman and her cat. Is it the ukiyo-e cat who is tiresome? It seems more likely that the title refers to what cats always appear to be thinking! As you can probably tell by his masterful use of simple lines and bold color Yoshitoshi was considered one of ukiyo-e’s greatest artists. For more of the stories behind Yoshitoshi’s art, check out the 100 Aspects of the Moon! A slightly different shift of narrative focus from the previous two pieces, Kiyochika Kobayashi’s 1886 artwork Cat and Lantern captures cats doing what they love to do best: causing playful destruction. Born in Tokyo, Kobayashi’s work commonly utilized a deeper level of color than many of his woodblock printing contemporaries. The use of darker shades gives his work a moody, almost night-time feel that’s hard to exactly articulate but definitely makes it distinguishable from other ukiyo-e print makers. This print created a little more recently, in 1926 is entitled Tama, the Cat and is the work of Hiroaki Takahashi, a Tokyo-based artist who produced some of his most striking pieces during the 20th century. Some of the most common themes that would appear in Takahashi’s work were nature scenes, Edo-era landscapes, and of course portraits of cats. Although his name may not be as famous as some of his predecessors, Takahashi’s work played an important role in setting a precedent for more modern ukiyo-e styles. His use of shading and blending colors especially, to craft perfectly balanced evening and night skies are unparalleled. In this particular piece however he’s kept it simple, opting for bold block coloring as the image’s main form. A whole different approach to Japanese cat paintings comes from Tomoo Inagaki an artist who specialized in the Sosaku Hanga movement. Born in the early 20th century, Sosaku Hanga was predominantly focused on the ideologies of pure self-expression, with artists bringing together their prints entirely by themselves. The production of ukiyo-e had traditionally been by small team including carvers, printers, and publishers, but Sosaku Hanga brought it back to basics. Without the weight of traditional motifs, Inagaki could focus all the viewer’s attention on the emotive subject, making a print that is incredibly beautiful in its bold simplicity. You can find out more about contemporary ukiyo-e in our Ultimate Guide to Japanese Art. Now it’s time to move into the 1950s, a time when Japan was in a large state of cultural flux following the events of World War II. As the nation became more connected with the western world, artists and stylistic influences from the west began to permeate Japan’s creative output. This piece by Masaharu Aoyama is a great example of the collision of western and eastern art ideals. The drawing of the cat looks similar to that of a classic British painting, however the simple wood grain background gives the undeniable sense of a specifically Japanese cat print. 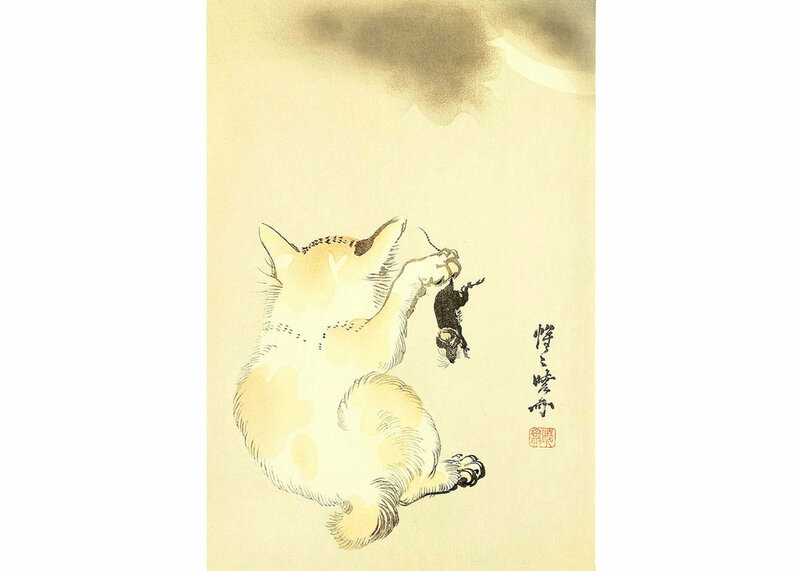 A nod to the past, but also a look to the future through the form of narrative playfulness is what you get with this piece titled Cat and Mouse by Kyosai Kawanabe. Born as the son of a samurai, Kawanabe became one of Japan’s first-ever political caricaturists. His almost tongue in cheek narrative style clear in this piece, which sees the cat holding a mouse in its paw rather nonchalantly. His ability to perfectly encapsulate attitudes through the posture and movements of the figures in his works garnered Kawanabe a reputation for being one of the most individualistic artists of his time. Drawing influence and dabbling in the world of nihonga painting, Togyu Okumura’s slightly more contemporary takes on traditional styles of Japanese art made him one of the most famous watercolor artists in Japan. For this most adorable example of Japanese cat painting, Leisure Day, we the somewhat disheveled character lounging with a concerned expression, in a wonderful demonstration of Okumura’s ability to interweave classic nihonga aesthetics into a rather contemporary image. An iconic figure in the evolution of Japanese art, Okumura always painted with one foot in the past and the other in the future, which is what made him such a celebrated name. A multi-disciplinarian, Tadanori Yokoo is one of the country’s most eye-catching contemporary artists. Throughout his career he’s worked as print maker, graphic designer, and more recently, a painter. His accessible, yet unique works have garnered him a following beyond Japan, and scored him a solo exhibition in the MoMA in New York. This particular piece balances somewhere between classic and kitsch, however leans just ever so slightly to the kitsch side. Created in 1997, the image is a silkscreen work that mixes both classic Japanese motifs like the waving cat (maneki-neko) and inari torii gates with a cross section of artistic styles, from photorealism to old ukiyo-e type imagery. Of course what you see here isn’t even a scratch on the tip on an iceberg. Luckily there’s plenty of literature out there to guide you through the world Japanese cat painting. One book we recommend is Cats in Ukiyo-e: Japanese Woodblock Print by Kaneko Nobuhisa featuring many of the curious and fascinating cats of Kuniyoshi Utagawa. This gloriously illustrated collection of 19th century ukiyo-e prints is an excellent jumping off point for both learning more about Kuniyoshi’s cat focused art and the techniques of ukiyo-e printing. You can buy a copy on Amazon here. Do you have a favorite Japanese cat painting? Let us know in the comments below! JO SELECTS offers helpful suggestions, and genuine recommendations for high-quality, authentic Japanese art & design. We know how difficult it is to search for Japanese artisans and designers on the vast internet, so we came up with this lifestyle guide to highlight great Japanese artworks and designs for your everyday needs. All product suggestions are independently selected and individually reviewed. We try our best to update information, but all prices and availability are subject to change. Japan Objects is a member of the Amazon affiliates program and if you buy something through our links, Japan Objects may earn an affiliate commission at no additional cost to you.